In his most powerful book about current events and the "prophetic pulse" since The Final Hour, a huge Catholic bestseller in 1992, Michael H. Brown takes the reader on a fast-paced tour through America's often hidden history, surveying everything from culture to politics to the credible apparitions of the Virgin Mary -- a perspective from George Washington to Donald J. Trump? It is a sweep through the decades and centuries that lead up to this present hour -- and what is America's last chance to recover -- to reclaim -- its Christian and Catholic foundation. "When we look at the signs around us, the division, the scent of uprising, the rumblings of war in a number of nations, the earthquakes along the 'ring of fire' that are now so common they don't even make the news -- we know that we are entering different and tumultuous times," comments the author. "Seers may not be able to spell it out precisely, but the prophetic pulse continues to materialize and those signs continue to rise around us." It is time to act. We now have the opportunity. It is time to take back what the enemy has stolen. It is a final opportunity -- the current moment -- to recover the Christianity of a nation that has been torn asunder by the conflict between Gospel and anti-Gospel, between Christ and the spirit of anti-christ, between what is holy and secular humanism and an often occult-inspired culture that have sought to place the nation in the hands of a hidden global elite. Read of those who have recovered almost Lazarus-like, of the man who was in a state of rigor mortiswhen a simple prayer brought him back, of those whose simple faith has rescued children and others from autism, paralysis, cancer. Author of The Other Side, Brown delves deeply into the concept of the "life review"; how our lives are evaluated upon passing by the Lord and His angels, the way in which our time on earth is evaluated (judged), and the importance of fulfilling and discerning our individual missions. This fascinating, powerful book will leave no doubt about the unfathomable kindness and understanding of God; His Mercy; and the beyond-phenomenal splendor of the destination we know as Heaven. Culled from Church teaching, near-death experiences, saints, and other sources, including modern revelations. Michael H. Brown, bestselling author of The Final Hour and The Other Side: a major work on prophecy based on recently approved apparitions as well as a mysterious private one that see events in the world soon reaching a 'crescendo,' as events in society as well as nature indicate truly transforming moments ahead -- events that will turn society as well as the very landscape around us into a very different place as the Lord moves now to prevent permanent damage to His Creation -- and to our souls! A tour de force that discusses everything from a new world order to natural upheavals that seem -- mysteriously -- to hint at coming fire. A book of inspiration, hope, and enlightenment by a bestselling author who has compiled and adapted the many popular articles he has written online for this little tour de force that covers a multitude of issues -- from healing and deliverance and joy and peace to preparing for death and the afterlife -- each chapter a little essay or article on how we pray best, how we purify, how with God there is always hope (an 'exit'), how we rid fear, obsession, attachment, what to do when we hit 'rock bottom,' and much more. A faith-filled and journalistic look at what happens when we die -- including in-depth descriptions of death, the parting of the soul, 'judgment,' transition to the other side of the veil, and the various regions which at the highest reaches will astonish you with their splendor and light! Of all his books, one not to miss because no other could be as important! Actual testimonies from those who 'returned' and insights on preparing for the wondrous day we all can joyfully reach! Fresh information and real cases that lend to the sights and sounds and Light of Heaven! Our bestseller! A booklet compilation, overview and close look at the growing claims that family lines can be plagued by problems caused by spirits that come down through the generations -- leading to illness, distress of many sorts, and inexplicable family tendencies! Yet something that a number of priests -- citing Scripture -- claim can be cast away through recognition of the problems, partaking of the sacraments, and diligent prayer. Included: extremely powerful prayer of deliverance, a family healing prayer, and blessing for salt. Michael H. Brown focuses on how God works in our lives, the miracles that are possible, the way we prepare ourselves to receive them, the route to holiness, with stunning examples of the miraculous and a deep sense of encouragement. 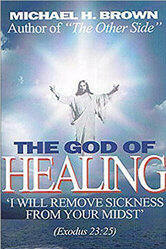 Does God really heal? Does He really watch over your life? Does He really cause all those fateful happenings and triumphant moments and coincidences that mystify us? A book that will inspire you and bring you up from the "downs" of life and give you hope no matter how hopeless life can seem! This is one of our most popular ever. What happens when we die? How are we judged? What's it like in Heaven, Hell, and Purgatory? Revelations, near-death accounts, and a reawakening to what life means! A hopeful book, a serious book, one that you and loved ones won't forget as you take a look at the final destination: eternity. Year after year one of the steadiest-selling book that we have ever carried, full of hope! A prophetic novel by Michael H Brown, in his first work of fiction, Brown pens the driving, suspenseful, and deeply spiritual story of a mysterious government property that harbors secrets relevant not only to a young cop who tries to investigate strange goings-on, but also to an equally mysterious and incredibly powerful old priest who joins forces with him to solve the mystery -- and try to prevent an end-times-like disaster!